The brave new XJ has stolen the hearts and wallets of Britain’s luxury car buyers, becoming the UK’s number one luxury saloon. But after six months on the CAR long-term fleet last year, did it steal ours? We actually ran two XJs – a long wheelbase 503bhp Supersport first, followed by a more sensible standard length 3.0 diesel. Before we get to the engines, let’s tackle the length issue. They’re both enormous so the LWB’s extra 125mm isn’t an issue to the driver. But the lack of those 125mm certainly is an issue for rear seat passengers in the small car. So if you, or any other adult, intends to spend much time in the back seats, the circa £3k premium is money well spent. Neither managed to replicate that pillowy ride of Jags gone by, though. I was once lucky enough to drive Sir William Towns’ own personal Series 1 XJ, and its small bump absorption is on a different planet to the current big Jags’. To be fair, it was riding on a wheel and tyre combination with the rim:sidewall ratio of a 1969 Honda ATV trike and the souffle like steering was more remote than a Victorian dad. But it proved that the new car doesn’t get everything right. Naturally, the supercharged 5.0 V8 was massively quicker than the diesel, and predictably, about 30% less economical. But, although the diesel is comprehensively outgunned by both the V8 and its German diesel rivals, I found the 3.0 TD V6’s balance of power and chassis more appealing than the petrol car’s. The Supersport often felt simply overhwelmed by its engine, and the combination of a crisp throttle and massive off-idle torque meant that I resorted to using the six-speed auto’s Winter mode to get out of junctions smoothly, a trick Jag chassis whizz Jeff Mitchell admitted he also employs. Speaking to him recently, it appears that Jag is aware of the problem and working on a fix. They’ve changed the supplier of the TFT instruments too. In my experience they promised much, but in practice barely moved the game on. Judging by the demo videos on Cadillac’s website, the new CUE display fitted to the XTS and ATS looks much better. Already fixed, apparently, is the XJ’s slightly too-light steering, although we’ve yet to try it. So here’s Jag’s to-do list: improve the instrument graphics and awful touch-screen sat nav, and soften the V8’s throttle tip-in. And that is about your lot, because niggles aside, I can understand perfectly why the XJ is finding so many customers. You might not like the styling, but at least it’s thought-provoking, and ensures the XJ will never get mistaken for a posh taxi (Merc S-class), or a salesman’s A4 (Audi A8). And the cabin is quite simply superb. In fact the Jag’s biggest threat comes from within. There’s a brand new Range Rover next year and it’s engineered by the same people that build the XJ. That being the case, I wouldn’t bet against it being the best luxury car on the planet. 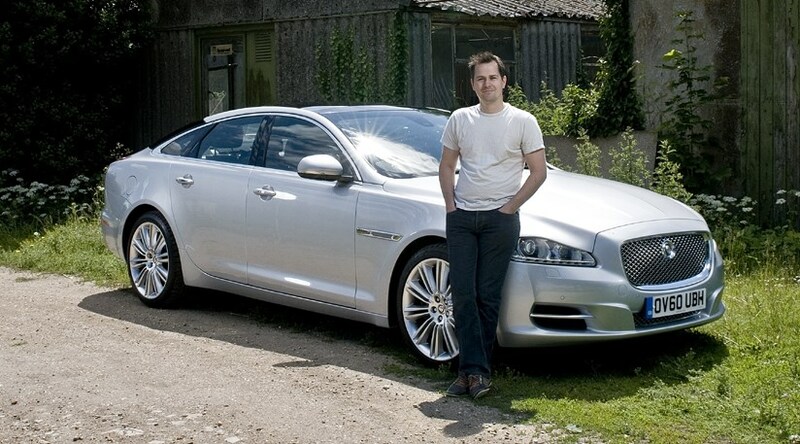 We’re pleased to report that the Jag’s been very reliable so far, certainly less troublesome than my previous Range Rover Sport, or Tim Pollard’s Jaguar XF long termer. But its copybook isn’t 100% blemish-free. I’ve had the dreaded ‘Smart Key not detected’ message a couple of times and recently a tyre pressure warning light has appeared on the dash intermittently. Now a fellow XJ owner has contacted us to say he was having the same problem with his car’s pressure monitoring. Although there’s no official recall notice for the defect, Jaguar says the valves have now been redesigned and cars going in for service will be modified. Something tells me our letter writer won’t be letting his local dealer, Hatfields of Hull, carry out the work. His car was supplied wearing the wrong wheels, and when Hatfield located a correct set, they managed to fit both wider rears to the nearside of the car, and the narrower fronts to the offside, resulting in a few near spins on the road before he realised what was wrong! Does our Jaguar XJ’s front end remind you more of a Mitsubishi Evo X or a Volvo S80? I forgot to ask Jag’s design boss, Ian Callum, for his thoughts when I bumped into him recently, but I did ask him whether he was still convinced that giving the XJ’s bold love-it-or-hate-it styling, particularly, the rear end, the green light was the right thing to do. We talked about the stunning sweep of the dash beneath the windscreen that seems to have been a big hit with buyers, and also about the fiddly touchscreen with its too-small, too hard to read graphics, that will be sorted in future Jags. Truth is, even now two years after launch opinion is still quite divided over the XJ. Most of the office are fans of the car in general, but those looks are still pretty Marmitey. And that's just the way Callum would like it, apparently. Thought a luxury car stretching to 5122mm should be massive in the back? Think again. We’ve tested the long-wheelbase Jag XJ alongside the SWB variant. And I’m afraid our current, ‘regular’ XJ is pretty cramped in the back. Perhaps I’m being harsh, but CAR recently had cause to transport half the team to London five-up in the Jag. Verdict? Three up in the back of the XJ: not a good idea. The mother of all transmission tunnels means your feet are splayed in one massive game of office footsy while the twin sunroof of our diesel SWB means there's embarrassingly little headroom for anyone over 6ft tall. And the worst bit? The outer rear seats are sculpted to tip you into the middle. Poor old Sarah-Jayne’s ribs haven’t quite recovered. Lessons to learn: the 5247mm XJ LWB is more accommodating in the back. And luxury cars in this segment simply aren’t meant to carry three rear-seat passengers. If you want to play limo merchant, pick a Galaxy or something rather than a posh saloon. Ex-CAR colleague, now Jaguar PR man Angus Fitton, reminded me about the new V6 petrol XJ being sold in China. Sales there were hampered by the country’s 85% import duty on cars with engines bigger than 3.0-litres. My 3.0 diesel would escape the tax, but China only takes the petrol variants – a naturally aspirated 5.0 V8 and the same engine with a supercharger strapped to it. Jag’s answer was to crane in the old 3.0 petrol V6 formerly available in the XF and previous XJ. Although the XJ’s aluminium body is light for its size, the V6’s 238bhp and 216lb ft are going to have to be worked hard. Reckon on 62mph in 8.5sec and 26mpg. Think I’ll stick to my 6.4sec, 40mpg (yeah, right!) XJ diesel. Cruise control – love it or loathe it? For me it’s a must have on anything this side of a GT3. Living in the middle of the country and needing to travel a couple of hours to a job, often very early in the morning or late at night when the roads are quiet, it makes journeys so much more relaxing. I also find it incredibly useful when driving through road works controlled by those dreaded Specs average speed cameras, such as the near 20-mile stretch on the A1 around Northallerton. My last five cars have had cruise control fitted, and all but two have had adaptive cruise, which uses radar to detect the presence of cars in front, and slows your car down if it detects a speed differential. The idea’s great, but in my experience it never works well in traffic moving at speed. The car simply can’t understand the actions of other drivers the same way a human brain can, too often slamming on the brakes when you know that the driver who has just pulled into your lane is only overtaking a slower car and will pull out of the way in plenty of time. So I was pleased when our long term XJ D turned up with regular cruise control, and not the £1275 adaptive system fitted as an option to the supercharged XJ we ran previously. Of course, where I do miss the adaptive system is in slow moving M25 rush-hour traffic, although the Jag's adaptive system still won’t bring you to a stop and pull away again automatically like a modern Audi or Mercedes will. The best compromise was the cruise control fitted to my old Lexus IS-F, which allowed you to switch between standard and adaptive cruise. Or of course I could just stop being lazy and try driving myself. It would be unfair to say that I’ve warmed to our XJ – because I’ve always liked it. But after a blast back from Wales following last month’s test between Jag’s new XKR-S and the Aston Martin Vantage S, I’m definitely much more of a fan. Jag’s current XK has never appealed to me, and despite the R-S version boasting 542bhp and great all-round ability, it’s just not where I spend £100k. Dynamically it’s brilliant, but it’s cramped inside, some of the detailing is dire (like the electric seat controls), and the XJ (and XF) feel so much more special and inviting. The Aston I love, and finally the Vantage S feels like the car that this famous British brand should have been producing since 2005. Small, nimble, and with a gorgeous engine note, it’s a lovely sports car – but only if you’re on smooth roads. Drive over anything slightly, well, British, and you’ll be begging Aston to ditch the fixed-rate dampers for the new adaptive system fitted to the Virage. Viewed solely as a luxury limo it has its faults, chiefly the slightly stiff ride, over-quick steering, and awkward to use touchscreen. But mix in a fast trip back across some of the best roads in Britain and the XJ starts to shine – now the fast steering and firm suspension of our car makes sense. Throwing an A8 or S-class around isn’t much fun, and while BMW’s 7-series is very good, it can’t match the agile ability of the Jag. I enjoyed my journey home in Chris’s Jag more than any drive I’d had in the two blue Brits over the previous couple of days. Okay, one particular blat in the Aston ran it close, but really, I had that much fun. Our 3.0D is just about quick enough, but like the basic Porsche Boxster I recently tried, it’s so much more fun fully exploiting a car than forever having to hold yourself back. That would have been the case in our old XJ Supersport (though some of you, like CAR reader DHDDGC, might want 503bhp rather than 271bhp). It’s still not the world’s greatest limo, but if you’re lucky enough to have some cross-country roads on your commute, or the time to take it out in the evening or on the weekend just for the sheer pleasure of going for a drive, then what you’ll experience will make the other compromises worth it. The XJ wasn't just a one-journey wonder either. I kept it over the weekend, and loved living with. It's a gorgeous Jaguar, rather than a generic German rival, which makes overlooking some minor niggles somewhat easier. Forget objectivity, celebrate subjectivity. Drove for the first time last night since breaking my foot over two months ago. My car of choice for an in-at-the-deep-end evening schlep down to my parents house near London and back by bedtime? Chris’s XJ. Diesel engine, lightweight aluminum chassis, auto ‘box, exquisite interior? All present and correct and ready to make my initial foray back behind the driver’s seat as easy as possible. And I got there in quiet, refined comfort, and the XJ impressed the parents way more than if I’d arrived in Greg’s overgrown A4. But there are too many niggles, not least the touchscreen with its tiny buttons – Chris recently described using it as ‘like trying to get your house key in the lock after seven pints in the Bull and Swan on a Friday night’ and I can’t think of a better simile. The actual buttons and dials sprinkled around the rest of the cabin are pretty small as well, and don’t press or twirl with the same solidity as any German rival. Then there were the awkward cruise control switches. Our old XF long-termer had a steering wheel spoke-mounted rotary dial that you just flicked to set the speed; now you’ve got to press a whole multitude of buttons tucked down on the bottom side of the boss. No different from any rival, but why abandon such a perfect solution? And now the buttons where your right thumb falls control the adjust-once-and-never-look-at-again functions like the cornering lights. I couldn’t get comfortable either, didn’t have enough headroom, couldn’t see where the front of the car stopped, couldn’t read the clock, and the rear screen distorts what’s behind you. The steering’s too quick too, there’s a little too much initial roll, and the ride isn’t the soothing, smooth affair you’d hope for. I love the Jag XJ design, both inside and out, love how special the cabin feels, love the looks it gets on the road, love the fact it’s not a default Merc/BMW/Audi, and love having the chunky key fob in my pocket. But the XJ feels like it’s trying to be both a sports saloon and a limousine, yet it can’t cosset like an S-class/7-series/A8, and at least in 3.0D guise it’s not a completely sorted sporty car. As much as I wanted us to get on, the Jag and me didn't quite click. My money (not that I have any) would go on Greg’s A8. Launched last spring, Jaguar’s bold new XJ limo has quickly moved to the top of the sales charts, so we added one to our long-term fleet to see what all the fuss is about. The XJ range stretches from £55,500 to £94,000 and is relatively simple to understand. There are two wheelbases, separated by 125mm; three trim levels: Luxury, Premium Luxury and Portfolio; and three engines: 3.0 diesel, 5.0 naturally aspirated V8 and 5.0 supercharged V8. Naturally, it’s the diesel that’s driving sales in the UK. Unlike the XF’s twin-turbo 3.0 D, which comes in 237bhp and 271bhp flavours, the XJ gets only the muscle motor. It’ll do 62mph in 6.4sec and returns 40.1mpg on the combined cycle. We mated our diesel engine with the short wheelbase chassis and top-spec Portfolio trim – 1200w Bowers & Wilkins hi-fi, 20in rims, suede headlining, four-zone climate control – and added just a couple of options: £250’s worth of digital radio and the dual-view television for £500. The bill came to £67,250. First impressions? It’s difficult to tell the long wheelbase from the short simply by looking at the body shapes. Rear passengers will certainly notice the difference, but this short wheelbase car still feels terrifyingly large around town and that fastback roofline means you come to rely on the reversing camera. Shame it gets covered in gunk during bad weather though; VW’s solution of hiding the camera under the flip up boot badge of the Golf is a much better idea. No issues with performance though. The 3.0 diesel can’t match Greg’s 4.2-litre A8 for straightline go, but I can’t say I’m feeling shortchanged. Except when I go to change gear: for nearly £70k I’d like to have proper metal, not plastic shift paddles. But given the problems we encountered with our old XF long termer, if that’s the extent of the quality demerits, I’ll be happy. And I’m pretty sure Jag will be too. Watch this space to see what, if anything, breaks first.